Driveways, paving and patios are often an easy way to add significant value to a property. Professionally laid, drives can last decades and make accessing your house a great deal easier. We can offer drive ways and paving to suit your needs and can lay gravel, stone, block, slabs, bricks or flagstones. Hayday Construction and Roofing have laid many driveways, patios and paths. Rural as our local area can be we often get asked to improve accessibility or to enhance available parking. If laid sympathetically to the land and situation paving and driveways can in our experience be one of the best returns on investment for property enhancement. 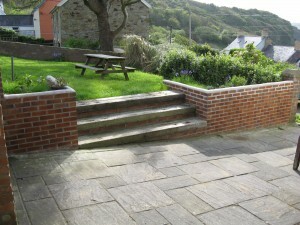 Having other expertise in roofing we are also particularly placed to provide slate paving and patios.